If it were 1987, no one would have batted an eyelid at the news that Jay Naidoo was detained by police. Back then it was expected, after all, being a Steve Biko inspired “terrorist”, organising the discord of black labourers into regimental units of resistance, Naidoo, in the eyes of the Apartheid state, was high on the list of public enemies. Fast forward to 2013, and Naidoo is detained, briefly, by the security police, in Swaziland of all places! By STAFF REPORTER. The radio, TV and newswires lit up in an instant. 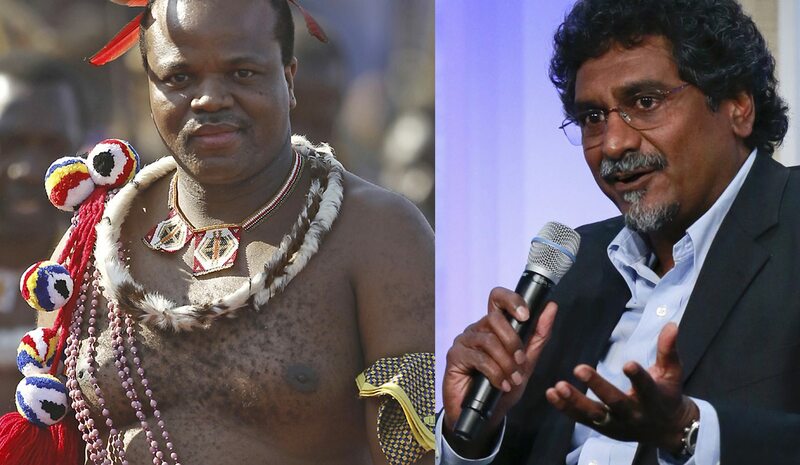 But behind the detention and questioning of Jay Naidoo, Bishop Paul Verryn and Alec Muchadehama (human rights lawyer and activist from Zimbabwe) lies a far more disturbing story, one that reads like a paranormal novel where kings hear “Divine Voices” amidst thunderclouds. So what were Jay Naidoo and his associates doing there? The International Trade Union Confederation (ITUC), in conjunction with Trade Union Congress of Swaziland (Tucoswa), requested them to participate in a Global Inquiry Panel as an international panel of experts that will hear directly from workers about how labour rights violations impact on the lives of ordinary Swazi’s. The enquiry kicks off today, 6 September, which is also Swaziland’s Independence Day. Swaziland gained independence in 1968. It functioned as a constitutional monarchy with a parliamentary multi-party system until April 1973. Whereas South Africa’s first democratic elections were preceded by a coalition between the labour movement, and Cosatu, SACP and ANC coalesced into the tripartite alliance, when then King Sobhuza II’s Imbokodvo National Movement (INM) party took power in 1968, the Ngwane National Liberatory Congress’ (NNLC) labour-oriented movement became the sole opposition party. The year 1972 saw the King’s INM party lose its outright majority in parliament, meaning that it could no longer amend the Constitution and 100,000 mineworkers went on strike to assert their constitutional rights. PW Botha clearly learnt a thing or two from his Swazi neighbours, since the King then set the trend by declaring a state of emergency in April 1973 and suspended the 1968 Independence Constitution. The central argument to why the Constitution was such a bad thing? It “permitted the introduction into Swaziland of highly undesirable political practices alien to, and incompatible with, the Swazi way of life.” In other words as soon as Swazi’s became rebellious rights conscious people rather than obedient subjects, their Constitutionally entrenched rights were stripped. So since 1973 the state of Swaziland left Swazi’s with a King who has been able to act wholly at his own discretion, not bound by law. Political parties were banned, the bill of rights was removed from the constitution, 60 days of detention without trial was authorised, the army was authorised to implement the King’s decree and workers had to obtain permission from the police before meeting together. By 2001, everyone hoped that Mswati III had regained his Swazi monarchal senses when he commissioned a new constitution, which was completed in 2005 and put into force on 8 February 2006. It includes a bill of rights which gives provisions of freedom of expression, assembly and association, yet it gives no rights to form political parties or the right to strike, and continues to vest all final authority in the King. Under monarchic rule, Swaziland has the highest national HIV prevalence in the world, with 26.1% of adults between the ages of 15 and 49, peaking at 54% among pregnant women aged 30–34. The CIA World Factbook ranks Swaziland 191 out of 198 countries in life expectancy, with an average life expectancy of only 47.36 years. It is thus clear that Mswati III and his advisors have a lot to do if this “monarchal democracy” he envisions is to holds greater meaning than some awkwardly named dispensation. The King’s divine epiphany, brand spanking new Constitution and recent tolerance of labour activity would never have had anyone think that his security police would dare detain and question, never mind delay, the international panel. Nonetheless, Jay Naidoo’s account of what could have been a worrisome situation shows that the security police didn’t get the memo. “We were followed from the airport by security police, then stopped at a police roadblock and taken to the regional police headquarters where we were questioned on the purpose of our visit. We shared information on the public hearings I am scheduled to chair. I went on to explain that I had been invited by the ITUC and that my role was to collect testimonies from workers in a public meeting and prepare a report for the ITUC. I was approached as a former trade union leader and former minister to see if we could find solutions to the challenges faced by Swazi workers. We were just questioned. It was reasonably cordial. But they will be present tomorrow at our meeting,” says Naidoo. Poor start for the “monarchal democracy” considering people of significant international renown are questioned and will be under security police scrutiny while hearing workers and their complaints. Particularly when your new Constitution supposedly gives freedom of association, expression and assembly. It could be argued that the seven-year-old supreme law is far too new to be appropriately understood and implemented, but if you want the world to believe that your country is reforming, that the voices of the people have meaning, it might be a good idea to steer clear of high profile repressive action. What is also clear is that Swaziland needs help. Ten percent of the country is reported to hold 60% of the nation’s income, but two-thirds of the population lives on less than one dollar per day. Poverty is especially widespread in rural areas, where roughly 80% of the population lives. Since Swaziland is not an economic hub, with South Africa being its largest trading partner, the King’s newly found interest for divinely inspired monarchal democracy looks more and more as pandering to international donors. Jay Naidoo is a Daily Maverick columnist.